TrafficMASTER Lakeshore Pecan's inviting grey/natural tones coordinate easily with just about every interior. What's more, Lakeshore Pecan is equipped with a simple fold down installation system that allows you install your floor quickly without the need for glue. This means that you can use your floor as soon as your installation is complete. 24.17 sq. ft. per case. Case quantity: 9. Case weight: 32.43 lb. Buy online TrafficMASTER Lakeshore Pecan 7 mm Thick x 7-2/3 in. Wide x 50-5/8 in. 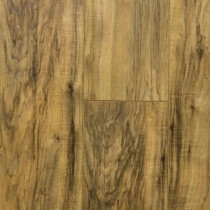 Length Laminate Flooring (24.17 sq. ft. / case) 35947, leave review and share Your friends.